A very powerful four stroke the 53 is superb for models such as the World Models Tai-Ji 40. Lots of power and good fuel efficiency make this a popular choice for both sport and scale. 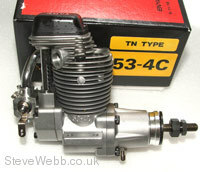 Enya 53.4C TN, Four stroke RC motor. 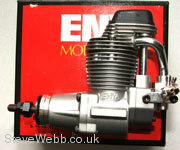 1.0 BHP ( Manufacturers Figure) Useful R.P.M 2,500 - 12,000 RPM.The engine features twin ballrace, with new twin needle carburetor. Arguably the best power to weight four stroke in the world. Without doubt undisputed leader in this class of engine. All ENYA RC engines are beautifully engineered and still precision manufactured in Japan meaning they have the best performance and are top value for money when you consider that that never seem to wear out under normal use. 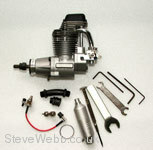 With all the pushrods and carb parts at the rear of the engine, they are much less prone to damage in a crash. Try a Bolly Cluban 11.5 x 7 or 12.5 x 6 as a starting point for sport flying. An Enya Number 3 plug and 5 to 10 percent nitro in the fuel is best. Please the Enya 53 is still supplied with full tool kit, it is not an expensive after market option. In engine tests in various magazines the power output was much higher than the manufacturer claims. Thats because Enya always quote useful BHP.